Dispels negative energy and cleanses the spirit. Promotes spiritual growth and discovery. Encourages truthful communication. Purifies the spiritual and material realms. Encourages longevity and strength. Enhances prayer and communication with the spirit world. Promotes healing and peacefulness, soothes heartache and emotional pain, attracts love and partnerships, and fosters protection and security. Aids clairvoyance and communication with other worlds. Drives away evil spirits and disease, and welcomes positive energy and health. 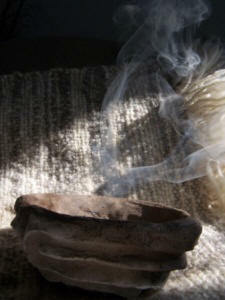 Eradicates unwanted spirits and energy, breaks old patterns and habits, and clears negative emotions. Creates room for growth and new life. Purifies and balances the mind, body, and spirit. Keeps one grounded, centered, and in touch with reality. Repels evil spirits and negative energy. Increases stamina and endurance, and enhances psychic powers and dreams. Fosters clear and coherent communication. Disperses negative energy, encourages patience and endurance, and relieves pain. Invokes a passionate love life and vibrant nature. Fosters inner peace and clarity. Increases sensitivity and brings order to the emotional body. Encourages dreams and visions, facilitates communication with the spirit world, establishes peace, and confers protection from ailments and adversity. Attracts love and courtship, promotes peace and harmony between loved ones, and encourages prosperity and passion. Awakens the senses and instills a sense of abundance. Mix powdered or crushed herbs together in small container, or tie strands of herbs together with thin thread or twine. Light the herbs and allow to flame for up to a minute. Extinguish the flame so that herbs are smoldering and smoking. Using a feather or hand, brush smoke towards yourself, and encircle your body with the smoke. Breathe, and visualize the changes that you wish to create in your new year.